The President Elect may trigger a baby boom -- or at very least a naming trend. If you voted blue last Tuesday, chances are you were in a pretty good mood by the end of the night. Maybe you raised a glass or five to the new dawn of the world's greatest democracy. Possibly you danced in the streets, if you get into that kind of thing. And as night turned into morning, maybe you went home and ended the whole magnificent ordeal with a bang. If so, you might be carrying an Obama baby. Colin Meloy stopped the Decemberists show at Terminal Five to ask the crowd, "How many babies were made last night!? There are going to be some Obama babies! Who knows, you might even have one in you right now!" reports the HuffPo's E.A. Hanks. 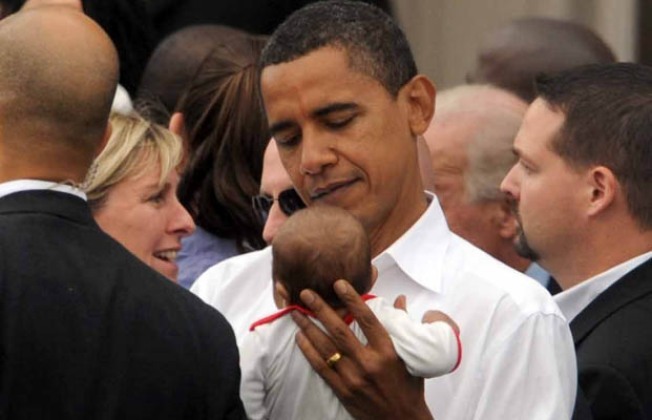 The Obama baby boom should take place around August 4, 2009, which Hanks notes is the Prez-Elect's birthday (weird, part I), meaning that he was conceived sometime around November 8th, 1960, a.k.a. the night JFK was elected (aaaaand part II). But that's ages away! The Times is reporting on a much more pressing trend taking place right now: Babies born since last week being given the name Barack (admittedly better than BHO's birthname, Barry), or Michelle. Or, in one case, Michelle Obama [lastname], just to make it perfectly clear that the poor tot wasn't named for Michelle Phillips, Pfieffer, or Williams. The Grey Lady excavates genius stats about past U.S. presidents' influence on baby-naming trends: "Franklin jumped to No. 33 in 1933, up from No. 147 in 1931. Dwight surged in the 1950s and Lyndon in the 1960s. Theodore hit its peak in the first decade of the 20th century." Meanwhile, a quick jaunt over to the Social Security Administration's baby-naming database (what, you didn't know we had one of those?) shows that "George" was the 147th most popular name for baby boys in 2007, making it less popular than Nolan (133), Omar (131), and Damien (137). Yup: Less popular than a moniker usually given to babies marked with the sign of the devil.